A piece of the American dream. 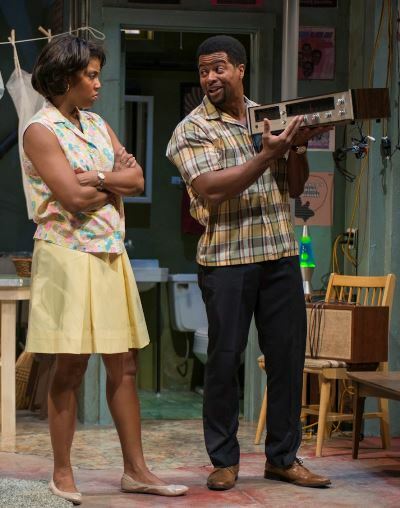 That’s really all the ambitious, optimistic Lank wants for himself and his sister Chelle in Dominique Morisseau’s blistering – and touchingly funny – drama “Detroit ’67,” currently illuminating the stage at Northlight Theatre. 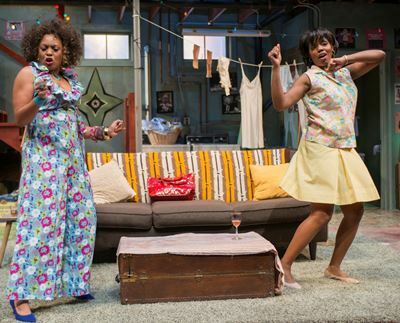 In their black neighborhood of 1967 Detroit, Lank and Chelle have carved out a very modest but decent life since the passing of their parents, running an after-hours bar in their basement, a place where folks can dance to Motown records and sip illegally dispensed booze. Chelle is good with that, but Lank wants more. He and his pal Sly have spotted a bar – a real joint with a liquor license available – that’s coming up for sale. Lank’s thinking this could be just the opportunity to spin the money he and Chelle have inherited into something they can be proud of, something they can grow. And since Lank (an irresistible charmer in the person of Kamal Angelo Bolden) has sis wrapped around his little finger, her initial resistance should be only a minor obstacle. Then the world outside blows sky-high; and all that is sensible – friends and reality and sure-things – is left broken, charred, bleeding. Armageddon has engulfed Detroit and shredded the fabric of dreams. Morisseau’s affecting and sharply crafted play is about spiritual survival in the storms of war. And the holocaust that befell Detroit was no less war than storm. What else do you call it when the regular army is called in to quell the violence, and the fearsome rumble of tanks penetrates the thickening weave of smoke and terror? 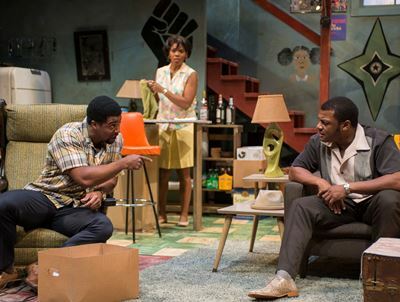 At its core, “Detroit ‘67” is also a play about family and friendship: anyone’s family, any true friendship. Before the deluge, we see these lusty, vigorous young adults pulling together to make a go of Lank and Chelle’s late-night party venture. Tyla Abercrumbie’s radiant, sweet-tempered Chelle is clearly sprung from the same generous-spirited stock as Lank; yet where he’s impatient to cut a wider swath in life, she’s content to preserve the life they’ve made – framed with deft naturalism by set designer Jack Magaw. Lank’s tactical assault on Chelle’s conservative position, as he maneuvers to sell her the bar idea, is hilarious. He’s going to attack at the edges and wear her down by degrees. And even though we see it coming a mile away, Morisseau’s dialogue is so true and has such a spontaneous ring to it that we really don’t know whether to throw in with Lank or sympathize with his importuned sister. Abercrumbie’s Chelle is no maiden-aunt type. She loves her Motown records, thinks the world begins and ends with the Temptations and seems to boogey her way through the day. Her pal Bunny – the effervescent Coco Elysses — is a worldly-wise chick who knows the worth of personal assets. They are delightful opposites, perfectly matched and inseparable. Lank’s buddy and co-conspirator Sly, a hipster who shows up in a silvery silk suit, is a ladies’ man with Don Juan’s own self-assurance. Kelvin Roston, Jr., doesn’t just play the role, he slides and struts it – a life-force among appealing characters who have found sustenance and joy in the portion that circumstance has provided. But into their midst comes confusion, temptation and trouble, all in the form of a bereft white woman whom Lank and Sly have found severely beaten on the street in the middle of the night. Cassandra Bissell brings to this visitor an aspect of rough mystery. Even while allowing her to stay and heal, Chelle is certain only bad things will follow this creature from the other side; Lank looks into her pallid face and sees a reflection of his own soul. Is the white woman bad luck, bad omen, warning angel? On her heels comes catastrophe indeed: riot, destruction, calamity and death. The events are beyond tragic; they are horrifying, and we are witness to the horror – not in its egregious actuality but in the mirror of Lank’s report, in the heart-stopping conviction of Kamal Angelo Bolden’s account of something he has witnessed. Deeply shaken, he cannot form words. His convulsing body, bloody shirt and saucer eyes tell us as much as we could tolerate. It is memorable, this inarticulate speech. 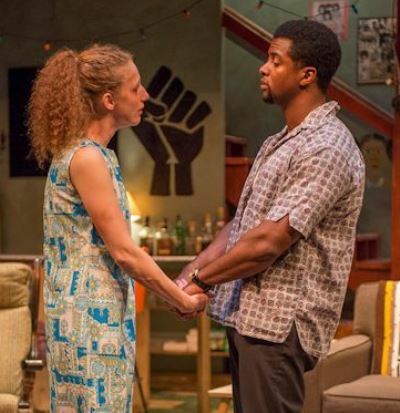 As he did with Lorraine Hansberry’s “A Raisin in the Sun” at TimeLine Theatre earlier this season, director Ron OJ Parson infuses Morisseau’s play with a fluency and vitality that draw the viewer ineluctably into the lives and passions of characters whose humanity we recognize as our own. The theatrical music here is of more than Motown.